Well, actually three ways. But I didn’t photograph the third way. Let me introduce you to the most amazing thing to come out of my crockpot since… well, that last amazing thing that came out of my crockpot. I call it Honey Chipotle Chicken. And I call it dinner for 4 nights this week. It starts with 3 lbs of chicken breasts, some honey, a can of chipotles in adobo, and some onion and garlic. ~5 hours later, you have enough chicken to feed a small army for nearly the rest of the week. An army that will absolutely adore you. The first night we made those tacos and quesadillas (because my 4 year old will not eat a taco that hasn’t been sufficiently smashed), topping them with pico de gallo and some crumbled goat cheese. For lunch the next day, I served it over a bowl of some fancy rice-quinoa mix. Then we made enchiladas. 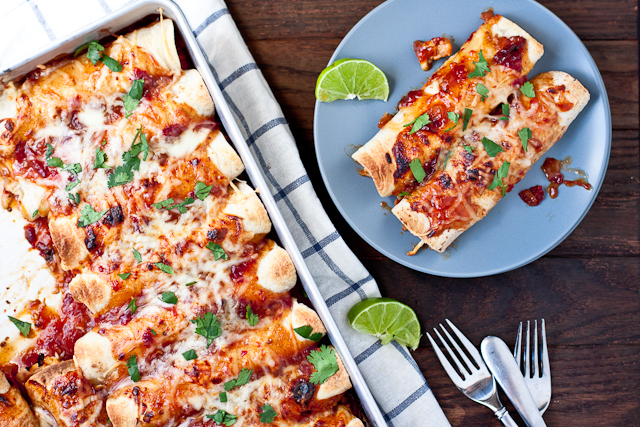 And I have no reservations about telling you this: They are absolutely the best enchiladas I’ve made or eaten. Ever. Sweet, spicy (but not craaazy hot), and cheesy comfort food. And I’ve still got 1/2 lb of shredded chicken and a cup of sauce left. I can tell you one thing – the weekend’s football munchies are going to be killer good. 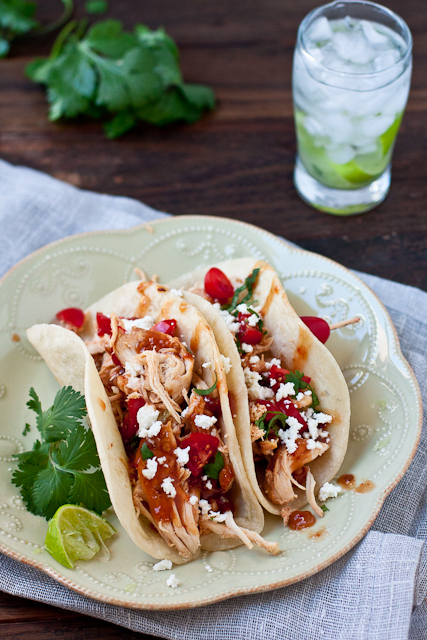 Sweet and spicy Honey Chipotle Chicken made in the crockpot. 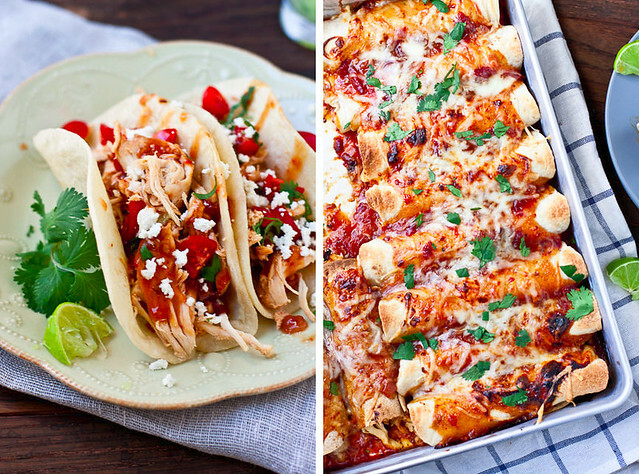 Tacos, enchiladas, sandwiches, or gameday appetizers - it's uses are as endless as the dish is amazing. Place chicken breasts in a large crockpot. Place the chipotles, honey, onion, garlic, a couple dashes of Worcestershire, and black pepper into a blender (you can chop/mince everything by hand if you'd like). Fill the empty chipotle can with water and add the water to the blender. Blend for 15-20 seconds until you have a pourable sauce (super smooth, homogenous liquid not necessary). Pour the sauce over the chicken and cook on low for 4-5 hours. Remove the chicken and shred (I am still loving this method! ); cover and set aside. Skim the fat from the top of the sauce or pour the sauce into a fat separator (I have this one and didn't use the strainer attachment). Transfer defatted liquid to a sauce pan on the stove over medium high heat. Pull out ~1/2 cup of liquid and whisk it with 3 Tbsp cornstarch. Add it back to the sauce pan and cook until it the sauce boils and thickens. I tossed 1/2 cup sauce with the shredded chicken to keep it moist and then stored the two separately (I had 3.5 cups of liquid). 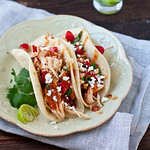 To make tacos, serve the shredded chicken drizzled with 1-2 Tbsp of honey chipotle sauce and top with chopped tomatoes, cilantro, and crumbled goat cheese. To make enchiladas, place 1/2 cup of sauce in the bottom of a baking dish. Preheat the oven to 375. Wrap chicken and a pinch of shredded cheese in each tortilla and place in the dish (I used half the cheese inside the enchiladas, the other half on top). Top with 1-1.5 cups honey chipotle sauce and the remaining cheese. Bake ~15 mintutes, until browning and bubbly. Serve topped with chopped cilantro (if you're not a hater). Going on the menu this weekend – cann’t wait! I just drooled over those photos! I have a lot of chicken I need to use up since my freezer died. This will be taking care of a lot of it, can’t wait to try! 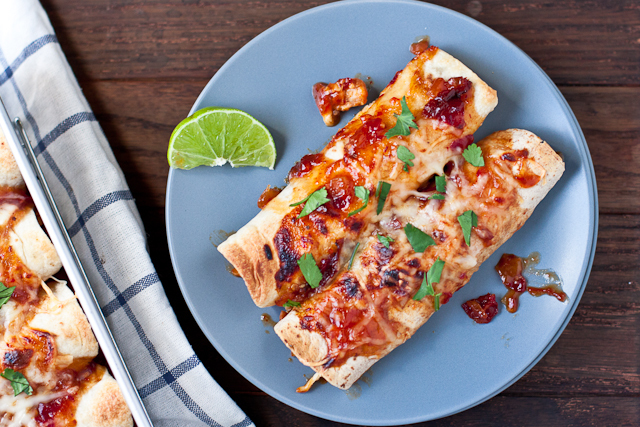 My family agrees: these are definitely some amazing enchiladas. The sauce was too spincy for the littlest one but everyone else had 2+. Great recipe!! I started them about two hours ago and my house smells so good right now! I cannot wait for dinner tonight! Darn 😉 Glad you guys liked it! 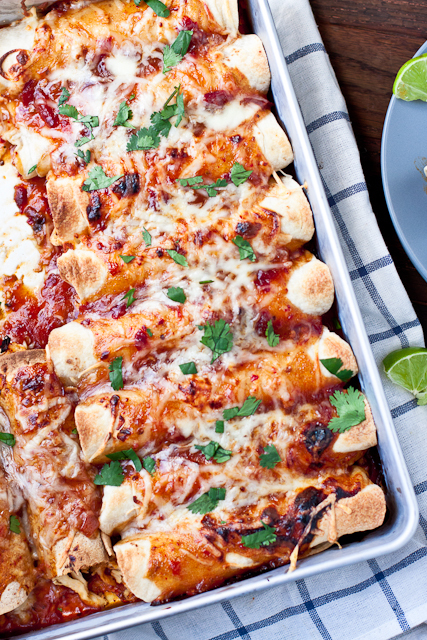 These enchiladas are so full of win. Even Better on day 3/if you ask me. Definitely putting these on my list to make one of these weekends! They look amazing ! I was planning to make feta and olive stuffed chicken breasts this weekend but I think I’m making this recipe instead. My son loves honey chipotle everything! I made these today, and my husband and I found them crazy hot! The grocery store only had one kind of canned chipotles, so that’s what I got, but I’m wondering now if there are a variety of types where you are and I ended up with the wrong kind? We both like a little heat, but we had to scrape all the sauce off and I ended up unrolling my enchilada and eating the chicken from inside. Ive never eaten or made enchiladas before, so I’m wondering if they’re supposed to be like that and I’m a wuss, or something went wrong? Oh no! They do have a good kick to them but it’s not *supposed* to melt off your face. I usually buy the San Marcos brand but my store does carry 4-5 different labels. Excellent! I didn’t blend the sauce, instead I.. Chopped the onions and garlic and kept the chipotle peppers whole, but with all the adobo sauce. When it came time to make the sauce, I had chunks of yummy onions and garlic. I removed the whole chipotle peppers and thickened the sauce. In doing so, the heat was dialed down a bit and I was able to get away with only using about half the honey. Plus, my enchiladas had small pieces of chopped onion, which made it to die for. I loved this recipe, thanks! And that is what a recipe is all about. Making it your own! Taking a method and adjusting it to your preferences! Thank you thank you thank you! This looks delicious! Do you think the leftovers would freeze well?